I’ve always loved the idea of a beauty swap. Two friends with the same passion for beauty that decide to send each other a package full of amazing goodies to both try something new? Sounds amazing! So when the wonderful Kimmy that blogs over at Beauty Isles asked me if I was interested in doing one, I said yes without a second thought. We agreed on a budget and told each other a few brands we wanted to try: here are the amazing things she sent me! I haven’t had the chance to try everything just yet, as I like to take my time and treasure every single thing I open, but I can tell you that I’m in love with everything. I wish I didn’t open everything the second I got into my car and took the time to take a picture of the amazing way Kimmy had packaged everything, because almost every single item was carefully packaged with beautiful thin paper, apart from the samples in a really beautiful tulle-style bag. I’ve never received so many beauty items at once, so it’s been a lot better than any Christmas opening them! - how wonderfully smelling is the Eos Lip Balm! I opened it this morning and my whole room smells minty now. Seriously Kimmy, thank you! I’m in love with everything and it’s been such a fun thing to do! I’m so glad we met though this amazing experience that is blogging and it’s incredible to have such a wonderful friend even if so many kilometers away! Are you curious to see what I sent to Kimmy? Here’s the post! 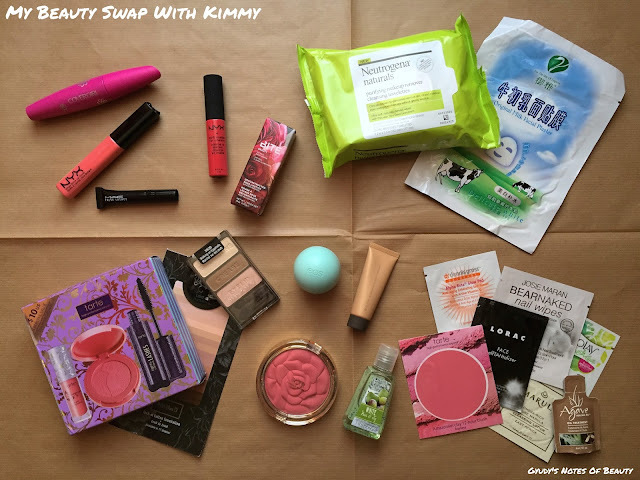 Have you ever participated in a Beauty Swap like this? What are the things you’d like to try but can’t get where you live? I usually like to change my makeup quite a lot day after day: there might be weeks full of “quick swipe of liner and no eyeshadow or I’m gonna be late”, but I still like to grab a different eyeliner everyday. And the same thing goes for base, cheeks and lips: I like to rotate between at least 3 or 4 products constantly, to avoid using the one same thing everyday and leave the rest of my collection untouched. There’s a cheek combo I haven’t been able to put down lately though: let’s see what I love about them and my favourite tools to apply them! I can’t help it, the day I discovered this contour powder I forgot about all the other options I had or wanted. I love it so much than when yesterday at Sephora the lady greeted me with the new Too Faced Cocoa Contour Palette - she knew it was something I could like! - I told her I was going to think about it. I couldn’t recognize myself, lol! Anyway, back to the product. 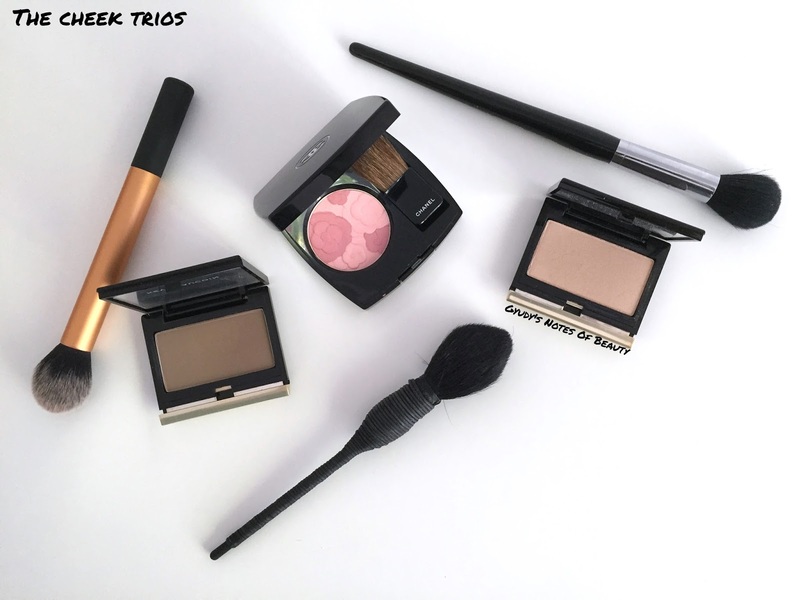 I told you about my love for it back in my December Favourites for the first time (link! ), and nothing has changed. I find it the perfect shade and texture, and one quick swipe gives me a lovely subtle yet defined contour that looks incredibly natural. The perfect tool? The aptly named Contour Brush from the Real Techniques’ Core Collection. Everyone seems to use this brush for something else, but I adore it for contour. It’s small enough to fit underneath my cheekbones but fluffy enough to blend the product, and it just works. I know, I know. This limited edition blush is probably impossible to find now, but the point here is: it’s the blush that flatters me the most as it just works with my skin tone. I love that I can wear it more subtly or go for a more intense look, the it blends perfectly and that’s got just the slightest hint of perfect glow to it. And well, it’s beautiful and it’s been staying that way for a really long time, with all the beautiful flowers still there despite the intense use (it’s been in heavy rotation since January, proof here!). So: find your perfect blush and apply it with the Nars Yachiyo Kabuki Brush is what I’m trying to say here (insert appropriate emoji). Seriously though, this brush is perfect (review). It makes the subtlest blush pop without effort and the boldest one blend with ease, and it works with every other kind of face powder if needed. I also got over the fear of washing it and just wrap up the handle in a small towel to avoid getting it wet and ruining it, and it’s been working perfectly. Kevin Aucoin has done it again, and its famous Celestial Powder is as great as the Sculpting one. I love highlighters, but I don’t like a too intense look: I have a few other ones I love (see my post about them here), but I love this one more as it’s the most flexible of them all. A dab of the brush gives a great subtle highlight perfect for daytime and a few swipes make for a great evening look, and it’s so finally milled that there’s not a single chunkier shimmer in sight. The brush I love to use with it is the one Sephora suggest for contouring: it’s small and soft enough for contouring, yes, but it’s got a flatter shape than the Real Techniques one and therefore I like it less than that one. It’s perfect for highlight though, as it allows to apply powder sheerly or to really pack it on and the shape is just right. 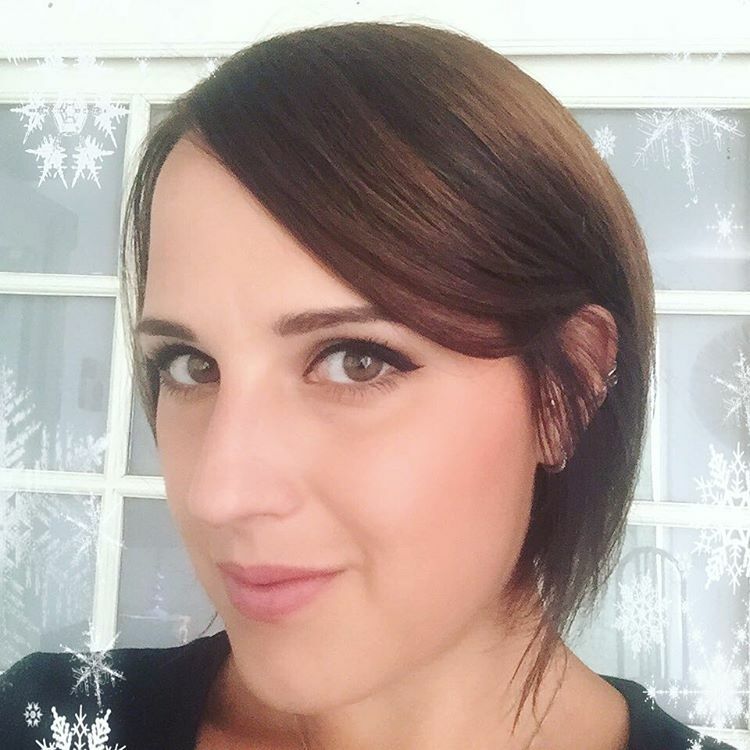 This is one of those rare months when choosing five products for my monthly favourites has taken no time at all. Two firm favourites and a couple of really new addictions, alongside a product that has improved my mornings: let’s begin! This eye cream is a beige and slightly luminescent fluid that’s really pleasant to apply and sinks in fast. You are meant to use the silicon-y applicator to apply it under the eyes, but I gave up after a couple of days and started applying it with my fingers as usual. The best part? I think it works! I haven’t slept particularly more or better lately, quite the contrary, but I’ve seen an improvement in my dark circles after nearly two months of daily use, and it’s incredible! You know I love this, but sometimes I have to remind myself I do. When I started using Vichy Idéalia Skin Sleep as my night cream I stopped using it and I don’t think my skin has been happy about that. Not that I don’t like the Vichy moisturizer, but my skin missed this! The first night I used it again I woke up with radiant skin, and it instantly reminded me why I love it so much: I’ve then started to alternate between the two and it’s been working amazingly. 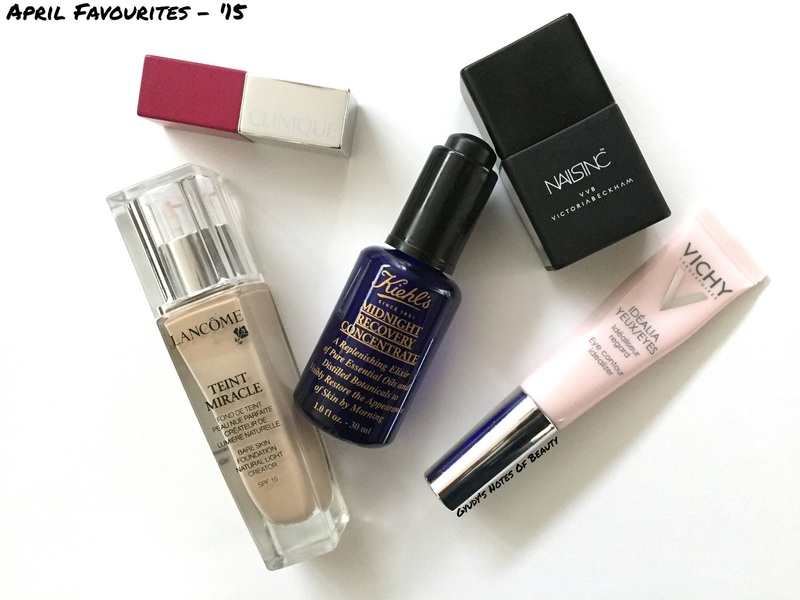 My love affair with this foundation started in January (proof in my monthly favourites here), and it hasn’t stopped yet. Moisturizing and glowy (which has became my primary requirement base wise lately) but with good coverage and good lasting power once powdered, I really can’t fault it. As you know I like to experiment with different foundations and like to always try new ones, but every time I use this again after a few days I can’t avoid being wowed by it all over again. I know, I’ve only had this for the last few days of April, but I couldn’t left it out of this favourites, I’m in love! The formula glides on the lips like nothing else and you can really feel the primer in it smoothing your lips. It goes on amazingly pigmented in one stroke, and I’m totally in love with the shade I got: have a look at it in this Instagram picture (link)! The only flaw? You can see it escaping from the contour of your lips if you don’t wear a transparent lip liner as a barrier: just remember to use that and it’s fine though. I have a soft spot for white and off white nail polishes, and this one might just be the best one of them all. A gorgeous pink tinged white, goes on with ease despite the slight difficulties with the first layer and looks incredible on the nails. It’s a really chic colour and the packaging is utterly beautiful, and with my usual The System from Formula X (reviewed here) it lasts a whole week without chipping (I still have it on and I haven’t been careful with my nails at all this week). I love it! Here’s what I’ve been loving in the last month: do we share any favourites? Have you tried any of these products? Questo è uno di quei rari mesi in cui scegliere cinque prodotti per questo post non ha richiesto che pochi attimi. Due prodotti fidati, due novità recentissime e un prodotto che ha migliorato sensibilmente le mie mattine… Cominciamo! Questa crema occhi è un fluido beige leggermente luminoso che è davvero piacevole da applicare e che si assorbe molto rapidamente. Si dovrebbe usare l’applicatore in silicone per applicarlo sul contorno occhi, ma dopo un paio di giorni ho rinunciato e ho cominciato ad applicarlo con le dita come al solito. La parte migliore? Penso che funzioni! Non ho dormito particolarmente di più o meglio ultimamente, al contrario, ma ho visto un miglioramento delle mie occhiaie dopo quasi due mesi di uso quotidiano, ed è incredibile! Sapete che lo amo, ma qualche volta ho bisogno di ricordarmene. Quando ho cominciato ad usare Vichy Idéalia Skin Sleeo come crema notte ho smesso di usarlo e non penso che la mia pelle ne sia stata contenta. Non che l’idratante Vichy non mi piaccia, ma questo olio alla mia pelle è mancato. La prima notte in cui l’ho usato di nuovo mi sono svegliata con la pelle super luminosa, e mi sono immediatamente ricordata del perché mi piace così tanto: da allora ho cominciato ad alternarlo con la crema e sta andando benissimo. La mia storia d’amore con questo fondotinta è cominciata a gennaio (prova nei miei preferiti qui), e non è ancora finita. Idratante e luminoso (requisiti diventati necessari ultimamente) ma con una buona coprenza e un’ottima durata con un po’ di cipria, non riesco a trovargli un difetto. Come sapete mi piace provare diversi fondotinta e testarne sempre di nuovi, ma tutte le volte che uso di nuovo questo dopo qualche giorno non posso fare a meno di pensare “wow”! Lo so, è stato nelle mie mani solo gli ultimi giorni di aprile, ma non potevo lasciarlo fuori da questi preferiti, lo adoro! La formula morbidissima scivola sulle labbra come nessun’altra e si può sentire la componente primer che leviga le labbra. È incredibilmente pigmentato in una passata, e adoro la tonalità che ho scelto: eccola in questa foto su Instagram (link)! L’unico difetto è che tende a migrare fuori dalla linea delle labbra senza una matita trasparente come barriera: basta ricordarsi questo step però ed è perfetta. Ho un debole per gli smalti bianchi e simili, e questo potrebbe essere il migliore di tutti. Un bellissimo bianco rosato, si applica benissimo nonostante le leggere difficoltà della prima passata come accade sempre con gli smalti bianchi e sulle unghie è semplicemente stupendo. È un colore davvero chic e il packaging è incredibilmente bello, e con il mio amato The System Formula X (review qui) dura un’intera settimana senza sbeccarsi (lo indosso da più di una settimana e non sono stata per niente attenta questa settimana). Lo adoro! Ecco i prodotti che ho più apprezzato questo mese: abbiamo qualche preferito in comune? Avete provato qualcuno di questi prodotti?